When Cassie Hobbes joined the FBI's Naturals program, she had one goal: uncover the truth about her mother's murder. But now, everything Cassie thought she knew about what happened that night has been called into question. Her mother is alive, and the people holding her captive are more powerful—and dangerous—than anything the Naturals have faced so far. As Cassie and the team work to uncover the secrets of a group that has been killing in secret for generations, they find themselves racing a ticking clock. New victims. New betrayals. New secrets. When the bodies begin piling up, it soon becomes apparent that this time, the Naturals aren't just hunting serial killers. They're being hunted. Bad Blood is the fourth book in the Naturals series. While some series can be read as stand alone novels, this certainly is not one of them. In fact, it has been a while since I read All In, book three in this series, and it took me several chapters before things started falling in place again. If you are new to this series, DEFINITELY read them in order. I absolutely love the characters and their abilities and hope Jennifer will someday write a spin off series with the teens a little older solving crimes that do not hit so close to home. I am always up for a good murder mystery and it would be a lot of fun reading some independent stories similar to the King and Maxwell series or even the Stephanie Plum books where we have a core group of characters solving a different case each book. We were introduced to a new character with a different "natural ability." This provided a new dimension to the story and would be a great addition to Michael, Dean, Cassie, Lia and Sloan's abilities. I have enjoyed seeing how the Naturals have formed a family and become closer throughout this series. Dean and Michael in particular were always at odds, but even they provided readers with some warm and fuzzy moments in addition to their witty jabs at one another. I was shocked at how everything unfolded at the end of this book. 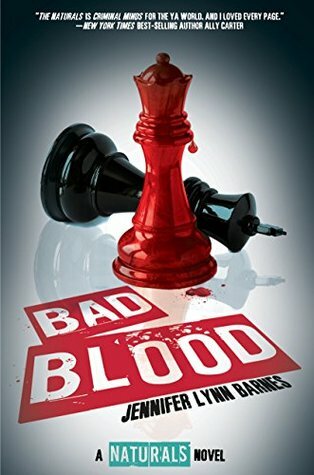 Bad Blood definitely has new meaning and was not what I anticipated from the title. Cassie is faced with an unthinkable decision after years of tracking down the people she thought were responsible for her mother's murder. In addition, we discover characters from prior books who were far more than they seemed at the time. While writing this review I discovered there is a novella, which is 4.5 in the series. I thought this was the end of the series, but now I can look forward to another 128 pages. They alluded to certain things at the end of Bad Blood that were so open ended, that I couldn't believe this was the absolute end. I am ecstatic to see that it is not. I am heading to my library app to request Twelve while the story is still fresh in my mind. If you enjoy YA and murder mysteries, this is a highly entertaining series with some amazingly talented characters.